Vinette Carroll spent much of her childhood in the West Indies. 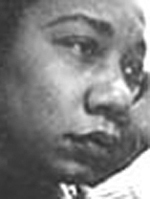 She was the first black woman to direct a play on Broadway (Don't Bother Me I Can't Cope, 1972). She shoulda stuck with directing. Her voice is flat & monotonous. Glad she appeared in only a couple of episodes. She was the mother in Up The Down Staircase. I loved her in that role. It's interesting to me how a few in a group of people can hear something one way and others hear it differently. Comments about Mother's flat delivery make me think of quite a few actors from early Hollywood and even some today who are readily recognizable and have made quite a fabulous career from their distinctive "flat delivery". Sometimes it's a tool purposefully used to establish a character. But to each his own. I personally enjoyed this episode very much. And appreciate the extra information on Vinette Carroll. Very accomplished lady!